The silver lining beneath Trump’s withdrawal from the Paris Climate Agreement is that we’re seeing action on the city and state level like we’ve never seen before. Internationally, the “Global Covenant of Mayors” say Trump’s decision will spur intensified action on climate change with 7,400 cities signing on. In the US, Mayors for 100% Clean Energy launched immediately after his announcement. Led by the Mayors of Miami Beach, Salt Lake City, San Diego and Columbia, South Carolina, they have been joined by 32 cities with concrete targets for 100% renewable energy. 118 mayors endorse the 100% goal and are working on plans to realize it, and 200 more signed an agreement to “adopt, honor and uphold” the Paris agreement. At the U.S. Conference of Mayors this month, mayors unanimously passed resolutions to stop Trump’s additional $54 billion for the military and give that money back to programs that support quality of life in the US, including environment, infrastructure, transport, senior and poor peoples’ needs. On the state level, the U.S. Climate Alliance formed, pledging to uphold US commitments to the Paris Accord. Led by New York, California and Washington State, 17 states and Puerto Rico have signed on. Together, the blue states are the world’s third largest economy after the US and China. “As the federal government turns its back on the environment, New York and states across the country are picking up the mantle of climate leadership, says NY Governor Cuomo. “The U.S. 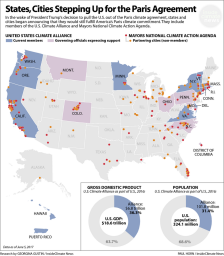 Climate Alliance is committed to meeting the standards set forth in the Paris Accord regardless of Washington’s irresponsible actions. Los Angeles County: formed its own municipal utility to lower power bills (expected to save 5%) and give residents greater access to renewables. “Community choice aggregation programs” are popping up across the country and next year, there will be 15 in California alone. Utilities still provide the power over existing transmission lines and collect payments, but the county sources where the electricity comes from and negotiates prices. The growing trend is to move away from centralized fossil fuel plants and high electricity prices. LA’s program begins next year. It will start by buying power from existing renewable energy generators, such as solar and wind, but it will also be able to develop its own sources like community solar and rooftop solar. Starting with a $10 million investment, they expect to reach $1.2 billion in revenue in three years, reports the LA Times. Washington State: Puget Sound Energy, the state’s largest utility, launched the “Green Direct” program. It allows local governments and corporations to buy part or all of the electricity from renewable energy projects. REI, Starbucks and Target are the first to sign up for the long-term contract at a set price. Seven Target stores, 116 Starbucks stores and the headquarters and 5 REI stores will be powered with 100% renewable energy. In Colorado and Minnesota, Xcel Energy is rolling out its own program, Renewable*Connect, reports GTM Research. Detroit 2030 District will create a green building district. The public/private partnership’s goal for 3 million square feet of existing buildings is to tighten up by as much as 50% on energy and water use and transportation emissions. 16 other districts across the US participate in the 2030 Districts Network, for a total of 300 million square feet. Led by New York State’s attorney general, 13 states are going to court over Trump’s gutting of fuel economy standards for vehicles. The regulations, negotiated as part of the auto industry bailout, would double average fuel efficiency to 54.5 miles per gallon by 2025. New York: Governor Cuomo launched the “Clean Climate Careers initiative” to grow the clean energy economy and prepare the workforce for long-term careers in the industry. The goal is to create 40,000 new, well-paying jobs by 2020 by expanding energy efficiency and renewable energy. The state is investing $1.8 billion for worker training, major renewable energy projects, and expanding energy efficiency and solar installations at public buildings. You may remember that as part of Trump’s announcement on withdrawing from the Paris Accord he said: “I represent the citizens of Pittsburgh, not Paris.” Well, Pittsburgh is one of the cities pledged to 100% renewables. Daniel Doubet, Executive Director of the nonprofit Keystone Progress said, “… we have seen your brand of charlatanism before. For generations, glorified highwaymen like you have come to exploit the people and land of western Pennsylvania, and gorged themselves on their spoils. These salesmen claimed gold would rain down on us, if only we let them dump toxins in our rivers. We didn’t buy it then, and we don’t buy it now.